on September 28, 2017, 11 a.m. Throw away that tie, but sorry gents – you’re going to have to stick with those trousers even if you’re hot! Men looking to cool off by wearing shorts to work should think twice. With just four in ten (39%) people surveyed across APAC agreeing that shorts are acceptable attire for men at work, the majority verdict is that gents are going to have to continue sweltering in the office. Their female counterparts face no such problems, with two thirds (66%) of people agreeing that it is acceptable for women to wear skirts above the knee. Despite the similarity between the two items of footwear, the difference in opinion on sandals vs flip-flops is stark. Just 35% of people think that it is acceptable for flip-flops to be worn in the office, against 56% for sandals. Whilst office sandals might be seen more as a female choice of footwear (63% of women felt they were acceptable), they are also seen as more acceptable than not by men (49% vs 46%). 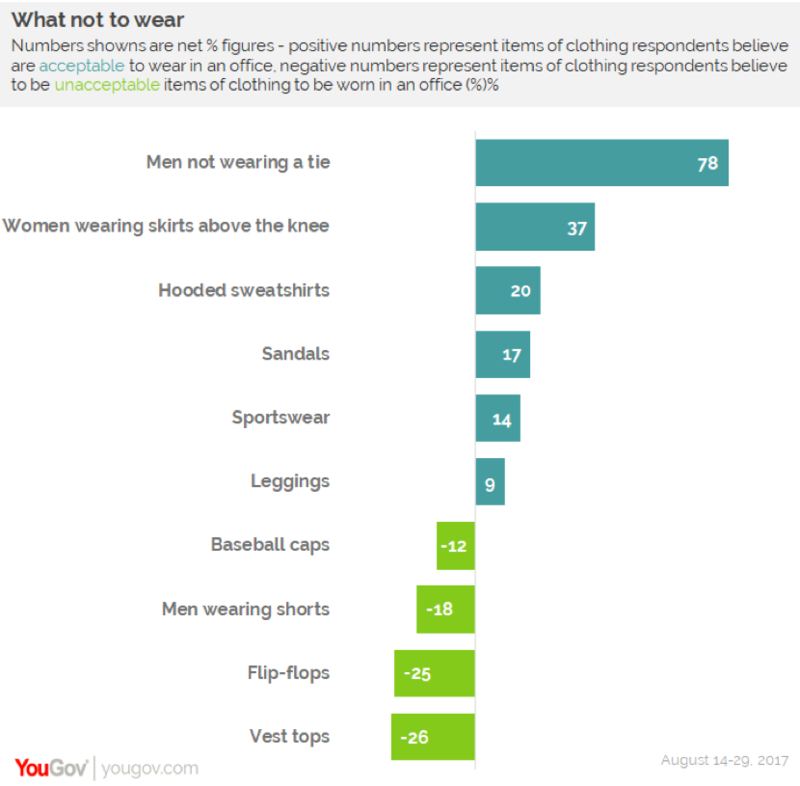 Men looking to cool down up top will also be dismayed to hear that barely one in three people think it is acceptable to wear a vest top around the office, although a small mercy is provided by the fact that people overwhelmingly feel it is ok for them to go tieless, with 87% in favour and just 9% against. Leggings prove to be the most divisive garment in the workplace. While widely accepted in Vietnam (by 73%), Singapore (67%), Thailand (59%), Philippines (57%) and Australia (50%), the majority of respondents in China (71%), Indonesia (54%) and Malaysia (52%) think leggings are unacceptable office attire. Hong Kongers are split, with no majority either way; 48% believe leggings are acceptable and 38% believe they are unacceptable in the workplace. Unsurprisingly, younger generations are more accepting of almost all items of clothing in the workplace, with the exception of women wearing skirts above the knee and men not wearing a tie. The generation gap is most apparent when it comes to hooded sweatshirts; while just a third (35%) of over 55s believe they are acceptable office attire, nearly six in ten (58%) 16-24 year olds are happy with hoodies in the workplace.